The Southlake Historical Society presents The Making of Town Square: An Evening with Rick Stacy and Frank Bliss, on Monday, April 16, 2012 in the Southlake Town Hall at 7pm. Mr. Stacy and Mr. Bliss were front and center with developer Brian Stebbins and architect David Schwarz when sixteen years ago this month, one hundred and fifty Southlake residents turned out for a meeting in the Community Center at Bicentennial Park to learn more about a proposed 109-acre commercial development that was to go in at Carroll Avenue and FM1709 on a tract of land that included the Fechtel Farm. Rumors were flying, and residents were both curious and concerned as to who the developers were and what they were planning. “The first vision that came to mind was Irving Mall,” one homeowner said. "I opposed any kind of development over there.” Things were happening in the rural town so rapidly in 1995 and 1996 that some residents called for a moratorium on commercial development. “There's not enough time to look at all the projects,” one council member complained. Southlake's population of 15,000 was growing to the tune of 2,000 a year. CISD student enrollment was increasing so quickly that the senior high school – only four years old in 1996 -- was already too small. Voters approved a $44 million dollar school bond that year. Southlake was about to pop. Mr. Stacy and Mr. Bliss will set the scene and share their recollections about the people, politics, and teamwork it took to build a downtown, something Mr. Bliss calls development from a ‘generational' perspective. Something that will last. They will share photographs of the Fechtel Farm acreage, photos of the square's groundbreaking, construction and ribbon-cutting ceremonies and more. The program is open to the public. Donations at the door are greatly appreciated by the Southlake Historical Society, a 501 (c)(3) organization. For more information about the program, contact Connie Cooley by email or call 817-223-9606. The Southlake Historical Society is grateful to the City of Southlake and the Southlake Public Library for partnering in preserving the history of Southlake. 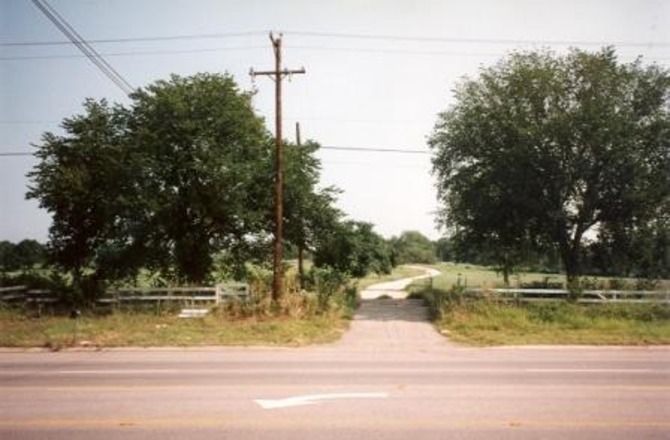 Pictured: Fechtel Farm entrance on 1709 prior to breaking ground on Town Square (upper left), Southlake Town Square as it is today (bottom right). The Southlake Historical Society was created in 1992 when area residents answered the call of an ad placed in the Grapevine Sun newspaper. Local resident (and former Southlake mayor) Gary Fickes challenged readers to create a preservation group as a way to gather and preserve Southlake's history. Since that time the Southlake Historical Society has been dedicated to archiving historical materials including scanning historical photos, gathering oral history interviews, helping in the research of both family and area business histories, developing programs for teachers and students, and working as the community advocacy group to preserve and protect Southlake's history.